After continental and southern Europe, the global gambling industry is now focusing on the Balkan states and Eastern Europe for its expansion. In the Balkan states most forms of gambling enjoy above-average popularity – foremost sports betting. These facts combined with the recent or impending EU-membership of many states and their growing individual wealth makes the Balkan one of the most relevant markets to be analysed. Total gambling market (gross revenue) of Euro 4.5 billion - In 2007 the total Balkan market had an estimated gross revenue (after payout of prizes) of ca. Euro 4.5 billion; the figure for turnover/wagers came to ca. Euro 25 billion. 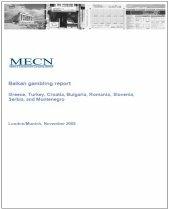 Most experts see great growth potential in Balkan gambling markets - More than 60% of the experts surveyed by MECN believe that the growth potential of the Balkan gambling market is great or even very great. Most operators are right now deciding whether to increase their investment in the Balkan markets. Some forerunners are paving the way - Intralot is on the way to becoming a betting heavyweight in the region; Sportingbet is realising about 4% of its business in Bulgaria; Bwin and Bet-at-home just recently increased their focus and investments in the region. Analysis of all sectors - The report analyses all key sectors of the gambling markets: lottery, casino, betting, gambling machines, and interactive gambling (Internet/mobile). Current market figures - Comprehensive market data, such as market size and development of sales/turnover as well as gross revenues, including 2007 and in some cases also 2008 figures. Legal and tax information - Detailed explanation of the current legislation and the taxes imposed. Insights from local expert - The analyses of Balkan gambling markets need local expertise. Therefore, we gathered some of the most renowned local market insiders and authors.